Book Review: Looking for Alaska by John Green - Book.Blog.Bake. 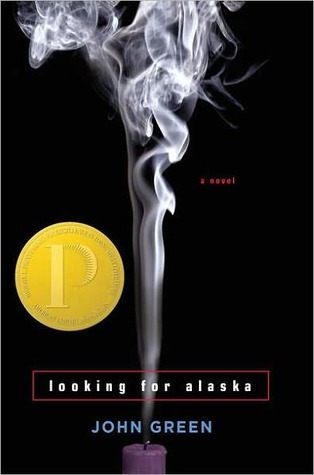 What can I possibly say about Looking for Alaska that hasn’t been said already? I resolved to read a John Green novel this year, so when I was gift shopping at Target and saw that shiny red bulls-eye sticker proclaiming this book was 20% off, I couldn’t help but to grab a copy of this deceptively slim book. I had put a quite a bit of pressure on this book. John Green seems to be on everyone favorite authors list, so I felt the need to be blown away by this book right off the bat. The first thirty pages left me a bit confused on why this book was such a YA classic. Miles was entertaining enough in his own head, but nothing seemed particularly interesting about him. Then Alaska walked into his life, and I started to understand. Alaska is a force of a character. She’s all over the map and she admits it herself. She’s incredibly intelligent, witty, and has a love for literature that rivals my own, but she also is full of self-loathing, destructive behaviors, and spirals out of control within seconds. Sometimes the novel seemed to wander aimlessly, but I always had a feeling we were headed towards something. Even the most mundane scenes seemed to have meaning the further along in the book I went. I loved the way the book tied so many things together, from Miles’ obsession with last words to Alaska’s love of poetry, suffering, the human condition, etc. It’s a short book, but it tackles many issues within the pages, even though I never got the impression that the book was written with an overarching theme. There clearly is a theme present, but it develops organically from the characters and who they are, not forced by the author. So I walked back to my room and collapsed on the bottom bunk, thinking that if people were rain, I was a drizzle and she was a hurricane. I know it’s one of the most popular quotes from the book and practically everyone’s heard it, but it was just one of many parts of the book that lodged itself into my brain and refuse to leave. Besides just how great of wording that sentence is, it’s also true. Alaska is wild and a bit beautiful, but destructive, whereas Miles, at least at first, is steady and safe but unimpressive. And the more I read, the more that became the entirety of the book that made a home in my mind and refuses to leave. It’s too early for me to say, but I think this may become one of my “Very Special Books”. That title can only be given on multiple readings, but it’s given to books that become more than just books to me, that help me measure my life and remember who I am and what words mean to me. At the moment, Looking for Alaska has a high chance of becoming a Very Special Book. Final Impression: Despite my reservations at the beginning of the book, this story soon grabbed hold of me and refused to leave. I became enamored with these characters and their antics. The ideas of this book totally captivated me and I understand why this book means so much to so many people. 5/5 stars. i really want to read this. i have read two john green books and loved one (the fault in our stars) and hated another (paper towns). Month Completed: March | Book.Blog.Bake. John Green is a complete genius. The Fault In Our Stars is one of my all time favorites, and I can’t believe I still haven’t read this one. I just bought a copy, and I’m definitely moving it up in my tbr pile. Thanks for the review! Thanks for stopping by! I just read The Fault in Our Stars(like, yesterday, actually), and I can see why so many people like John Green’s books now. I really recommend this one–I think I actually like it better than The Fault in Our Stars. Even though I own this book, I actually just finished the audio version last week. I am in total agreement with your assessment. I also went in expecting greatness, and I agree it is a bit deceptive in how good it actually is. It really has stuck with me. There’s just something about this book that lingers with you! I think the ability to be organic is really one of the best things that contemporary books have to offer. Don’t get me wrong, I love my fantasy and sci-fi, but I’ve found a lot of contemporary YA does a really awesome job of letting characters develop naturally and learn lessons without seeming overly sentimental or preachy, and I think that’s why this book connected with me so much. I also vowed to read a John Green book this year, with so much great talk going on about him it would be silly not to experience his writings. I opted for the much talked about The Fault In Our Stars, and I have no regrets about that! I shared a number of feelings about that novel as you did about yours, particularly with the beautiful sentences and it being a ‘special’ book (It is quite posssibly the best book I read all year so far). I can’t wait to delve in to more of John Green’s work. I read The Fault in Our Stars yesterday, and while I still prefer Looking for Alaska, I can see why everyone enjoys it so much! I really like the complexity in John Green’s books. They’re very layered, and I appreciate that. Glad you enjoyed it. I think this is a book, I’ll reread often and discover something new each time I do. My only JG so far but it won’t be my last. I have a similar feeling–my favorite kind of books, the ones that can be read over and over again and you come away a little different each time. I JUST read The Fault in Our Stars(like, yesterday!) and while it’s really well-written, I’d recommend Looking for Alaska over it, especially as a starting point for a John Green book. It feels more. . . I don’t know, authentic? Organic? Not that The Fault in Our Stars doesn’t, but I think the hype surrounding that one and the subject matter automatically regulated that one to a slightly lower status for me, whereas Looking for Alaska feels. . . fresh, I guess? It’s hard to describe the difference between the two, but I think the fact that Looking for Alaska was his debut has a lot to do with it.